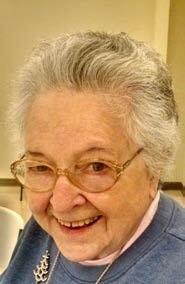 Betty Jean (McGilvary) Danford, age 89 of Fort Walton Beach FL, passed away peacefully on November 20 2018 just after midnight. Betty was born on August 4, 1929 in Marietta GA. to the late Ralph McGilvary and Irene Abercrombie. She graduated from Marietta High School in 1946. Betty was dedicated to her late husband LtCol Harold Q Danford (Quent) and her family, friends. Betty loved her family and is survived by her 3 children; Sandra Danford-Reass, Douglas M Danford, David A Danford, 6 grandchildren and 10 great grandchildren and numerous other family members including a sister, nieces, nephews and cousins. Betty had unwavering faith in her God and church family. She attended the Church of Christ of Fort Walton Beach for 38 years. She led the Ladies Bible Class for 18 years and always stepped up when a need arose. Betty was also known for her delicious deviled eggs which were always a big hit at potlucks. Quent and Betty opened their home wherever they were stationed to many young people and military personal who where away from home and counted them as extended family. Many of these relationships continued to this day. In lieu of flowers please donate to your favorite charity in her name.